Senate President Juan Ponce Enrile is a living legend in Philippine politics and a key figure in Philippine history. As as a Cagayano, I believe that we should all know about Senator Enrile, his life and his legacy. His autobiography, Juan Ponce Enrile: A Memoir, is also out. I do hope I could get a copy soon. Mabuhay ka Manong Johnny! The Science and Technology Undergraduate Scholarships 2013 are open to fourth year high school students belonging to the top 5% of the graduating class and who wish to pursue priority fields of study in the sciences, mathematics and engineering. The DEADLINE FOR FILING OF APPLICATION is on October 5, 2012 (Friday)and the EXAMINATION will be on November 18, 2012 (Sunday). I was browsing around the net when I stumbled upon Living Asia's travel guide for Cagayan Valley (Region) and Cagayan (province). The video was posted on YouTube May 2010. Yep, not that new but still pretty good and very informative. A magnitude 7.6 earthquake happened 90 miles off of Samar leaving 1 dead and minor infrastructural damages. Considering the magnitude of the earthquake, we were lucky that the damages are minimal. So far, I don't remember any strong quakes happening in Cagayan during the last decade, the last earthquake I remember occurred during the speech of then President Gloria Arroyo at Tuguegarao. Still, it is important that we are aware of what to do in case this happens in Cagayan. I recently read a news article from the Philippine Information Agency stating that dengue cases in Cagayan is on the rise. Click here to read article. There's no cause for panic just yet. We can all do our part in preventing and keeping our communities safe from dengue. 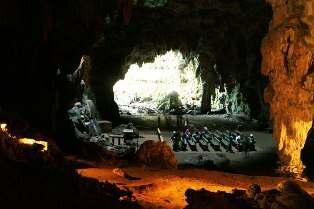 A visit in the province of Cagayan would not be complete without a visit to the Callao Caves. Which was declared as National Park under RA No. 7357. It is considered as one of the province’s major tourism destinations. Aside from being a popular tourist site, Peñablanca is also the largest municipality in the province. The town of Lal-lo is perhaps the most historical place in the province. Named Nueva Segovia by Juan Pablo Carreon in 1581, it is the oldest town in Cagayan. In fact, it is even older than the province itself which was only established in 1583. In 1595, Pope Clement VIII declared the town as the seat of the Diocese of Nueva Segovia whose territory includes the whole of northern Luzon (from Zambales all the way up) however, the seat was transferred to Vigan in 1755. Lallo was the also fourth city established during the Spanish Era, (the first was Cebu in 1565, Manila in 1571, and Naga in 1575) and it was the capital of Cagayan up to 1839 when the Provincial Government was moved to Tuguegarao. The oldest suspension bridge in Asia, the Magapit Suspension Bridge is also found in Lal-lo. From Tuguegarao, you can either take a public van or a bus for a 1 hour and 30 minute ride to Lallo. For independent motorist, Lallo is approximately 65 kms north of Tuguegarao.